Vendor rating is a comprehensive tool for assessment of vendor reliability and trustworthiness. Making a decision to buy something, customers often rely on the seller rating. Now the Vendor ratings add-on allows your customers to evaluate their shopping experience with a particular vendor and thus help other customers. Rating system also stimulates vendors to improve their services and care about credibility. As a result, the quality of services and goods sold in your store will be higher. 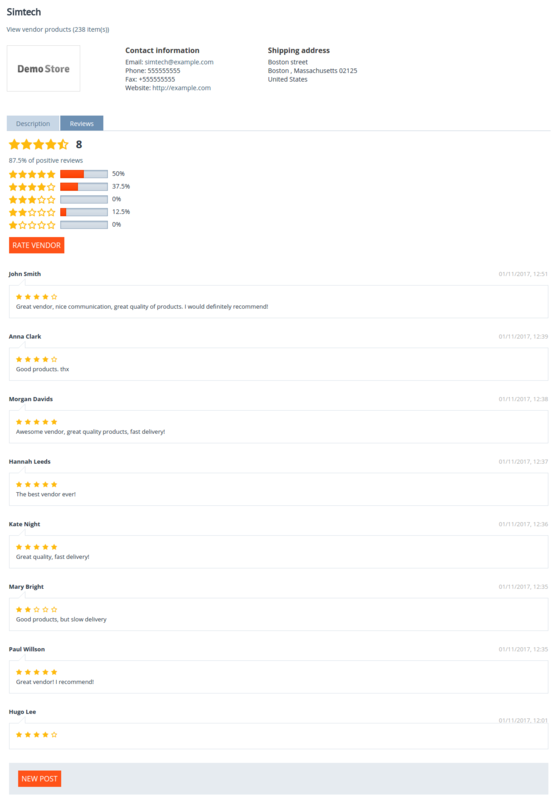 The Vendor ratings add-on displays a 5-star rating with the percentage of positive reviews. Also, we see the number of rates given to this vendor and the percentage for each star (on a 1 to 5 scale). Ability to specify how many stars will be considered a negative review. Rating next to the vendor name. The vendor rating tab on the product details page. 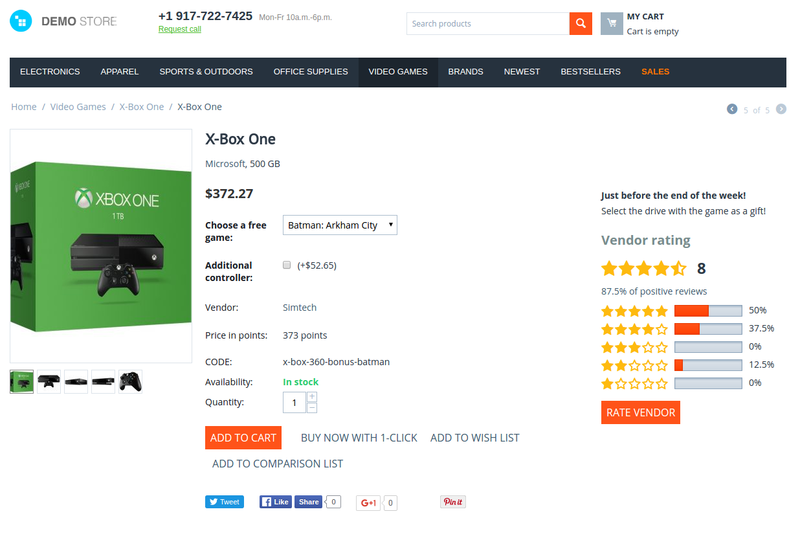 Vendor rating in a special promotion block on the product details page. [!] Error due to non-existing function in 4.5.х-4.8.х versions. Fixed. [+] Additional stars for the vendor rating have been added. [~] The "Vendor Rating" table has been adapted to mobile and tablet versions. [!] The pop-up that appeared by clicking the 'Rate vendor' button was displayed incorrectly in the IE browser in the store version 4.9.1. Fixed. [!] 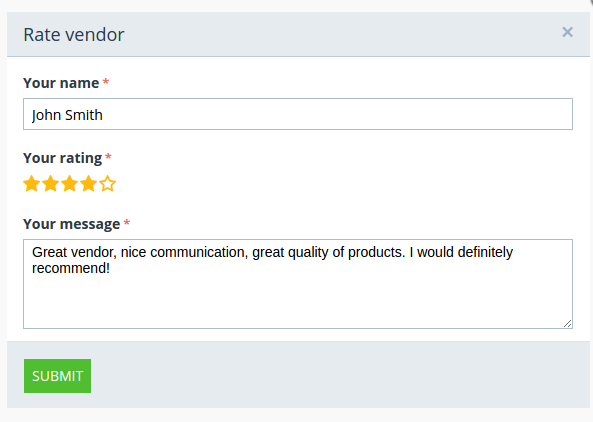 The Rate vendor button displayed on the Followed vendors page of the Follow vendor add-on even if the 'Allow to post only for buyers' setting was disabled on the Vendors tab in the default Comments and reviews add-on. Fixed. [!] Incorrect vendor rating was displayed in some cases. Fixed. [!] Email about low rating wasn't received. Fixed. [!] A Service unavailable message appeared after clicking on the Review push notification. Fixed. [!] Vendors rating block moved on the Product combinations table. Fixed.